Plate 17 from James Baillie Fraser's 'Views of Calcutta and its Environs'. 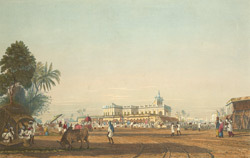 Fraser (1783-1856) arrived in Calcutta in 1814 and in six years produced these animated sketches of the busy city, published later as a collection of 24 superbly aquatinted plates. He included in this collection two views of the Lall Bazaar, "famous for its punch houses and other places of entertainment..."
At the east end of Lall Bazaar was the Bow Bazaar, sometimes called Boytaconnah Street. The accompanying text reads: "At its eastern end, where it joined the Circular Road stood a Catholic Church with its northern facade on Bow Bazaar. The Circular Road runs across the picture, while the tracks sweeping round from the left are those of carts heading eastwards to the Salt Water Lake. This is the church of Our Lady of Doris, begun in June 1809 and consecrated a year later, built by the munificence of Mrs Gracia Elizabeth."